For years readers have been asking us for a convenient way to keep track of the books they’re reading. As we prepare to step through the threshold into 2018, we’re happy to announce the release of a brand new Reading Log feature which lets you indicate all the books you’d like to read, books you’ve already read, and books you’re currently reading. You can now mark a book as “Want to Read”, “Currently Reading”, or “Already Read”, in addition to adding it to one of your themed reading lists. 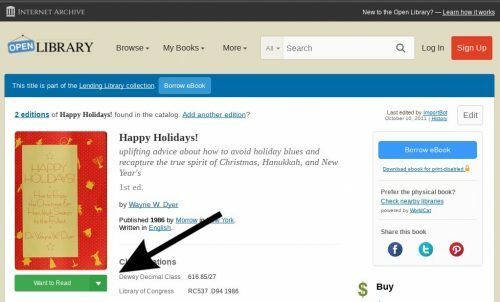 Any time you go to a book page on Open Library, you will see a new green button with the text “Want to Read”. By clicking on this button, you can mark this book as a work you’d like to read. By clicking on the white dropdown arrow on the right side of the button, you can select from other options too, like “Currently Reading” or “Already Read”. Once you click one of these options, the green button will appear gray with a green check, indicating your selection has been saved. Where can I review my Reading Log? You can review the books in your Reading Log by clicking the “My Books” menu and selecting the “My Reading Log” option in the dropdown. 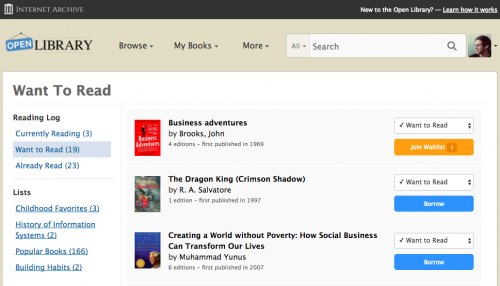 From this page, you can manage the status of the books you’re reading and easily find them in the future. Who can see my Reading Log selections? Books you mark as “Want to Read”, “Currently Reading”, or “Already Read” are made private by default. We know some people want to share what books they’re reading. In the future, we hope to offer an option for readers to make their Reading Log public. Can I Still Use Lists? You can still use your existing Lists and even create new ones! In addition to giving you a convenient way to log your reading progress, you can also use the green dropdown menu to add this book to one of your custom themed Lists. We hope you love this new feature as much as we do and we’d love to hear your thoughts! Tweet us at @openlibrary. Is the Reading Log feature not working as you expect? Please tell us about any issues you experience here.